If you’ve ever wanted to live less than three miles from the birthplace of Elvis Presley, now is your chance. I am a 1929 Tudor Revival home located in downtown Tupelo, Mississippi, the hometown of the King of Rock 'n' Roll himself. The quaint, quiet neighborhood I call home is on the National Register of Historic Places. Tucked away a stone's throw from downtown, I am close to restaurants, schools, the library, and local museums (including one dedicated to Elvis) without being caught up in the bustle. Recently renovated by an award-winning master builder, I have all the luxurious finishes you want for modern life alongside lovingly preserved historic features, such as hardwood floors, wood trim, and crown molding. You’ll also love my signature Tudor Revival diamond-pane windows that give the living and dining rooms character while letting in plenty of light. Beautiful wood doors and fireplaces add extra glamour, as does a built-in sculpture niche in the hallway leading to the stairs. 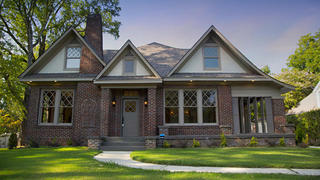 Five bedrooms and four bathrooms are spread out among almost 5,000 square feet of living space. You’ll love the elegant finishes in each bathroom, and my freshly painted and carpeted bedrooms are spacious and offer ample closet space. Recessed lighting combined with accent chandeliers make each of my rooms an elegant space. Fashionistas in the family will adore my enormous dressing room, featuring three walls lined with built-in shelving, garment racks, drawers and a full-length mirror along with a historic fireplace and a quartz-topped vanity. You won’t have to worry about having too many cooks in the kitchen with the size of my spacious chef’s kitchen, featuring quartz countertops, stainless steel appliances, a 12-foot island, and a wet bar with a wine refrigerator. Curious to learn more? Click here to read my full listing. 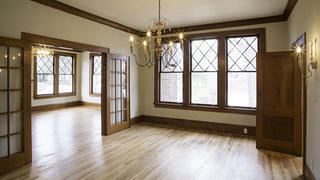 Diamond-pane windows, wood trim, and beautiful doors speak to my historic character. 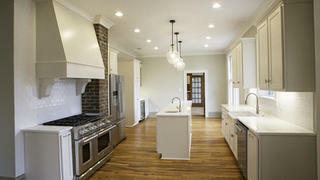 Newly renovated modern updates like my chef's kitchen give you the bells and whistles of modern living.